Deep House has its foundations set in the liquid blend of Chicago House, 80s Soul, Jazz-Funk and Detroit Techno that's earned it attention for decades, however, 'EDM Essentials: Deep House' celebrates the new breed of Deep House: From Disclosure to Duke Dumont, Ben Pierce, Hot Natured and more, there's a new school of artists owning this scene and 'EDM Essentials: Deep House' is your ticket to join them. Build your Deep House mix from the foundations upwards with over 185MB of Bass Samples, Bassline Loops, Drum Loops, Drum One-Shots, SFX Hits, SFX Loops and Synth Loops! With a total of 130 original samples divided into 5 stuffed folders, this Deep House sound library definitely delivers the goods. 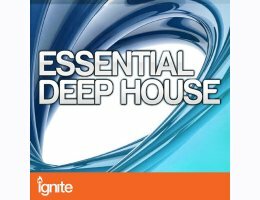 From the hollow bounce of bass loop 'Boro' to the rubbery palpitations of bass loop 'Typik', the ominous sustain of bass sample 'Owl' to the jacked n' scratched drum loop 'Doshi' and the atmospheric breeze of synth loop 'Fremis', there's a huge variety of sounds to be found in 'EDM Essentials: Deep House'. Arriving in your download folder at an astonishingly crisp 24-bit High Definition sample rate, you can simply click, drag and drop these samples into any major DAW and they'll sync automatically to any mix, matching the key and tempo. The standard tempo of this Deep House sound pack is 120BPM, but if you're starting a mix from scratch, you can manually click and drag the stem to any speed you require.